Unity is the spirit of the elements in your art working together. When you choose to unify the elements, you are providing greater power, impact and emotional strength in your work. Unity is achieved when every part of the picture agrees with every other part of the picture. In a perfectly unified picture, nothing would be out of place, and everything would make sense of everything else. A well unified image reveals a clear concept and all the parts testify to this. Unity can be defined in negative terms, which is to say that when a picture lacks unity, some part or parts seem out of place. This can happen when the colors do not agree or make sense together. Also disunity exists where the marks are of such different character that they clash. Further, your picture will appear as if it ought to be reduced by being split into parts. A common pitfall is to divide the picture plane, either horizontally or vertically, with two completely disparate ideas, such as a very light blue sky and dark, dull brown land form. I was working on an image this week in the studio which portrays a darkish boulder field tumbling down on the right hand, and a watercourse splitting the image by dividing off the left side. I decided to kill the waterfall idea altogether, as the boulders were rendered with a fine, shadowy mood, and I felt that the narrative of a waterfall was in opposition to the moody image already there on the rocks. Using colored ground is a fine start if you want to unify the middle values and supporting hue in a painting. A neutral value and hue, such as Sienna brown, is a warm and fairly unobtrusive beginning from which to build upon. It helps by establishing a singularity of color "all-over" the image. 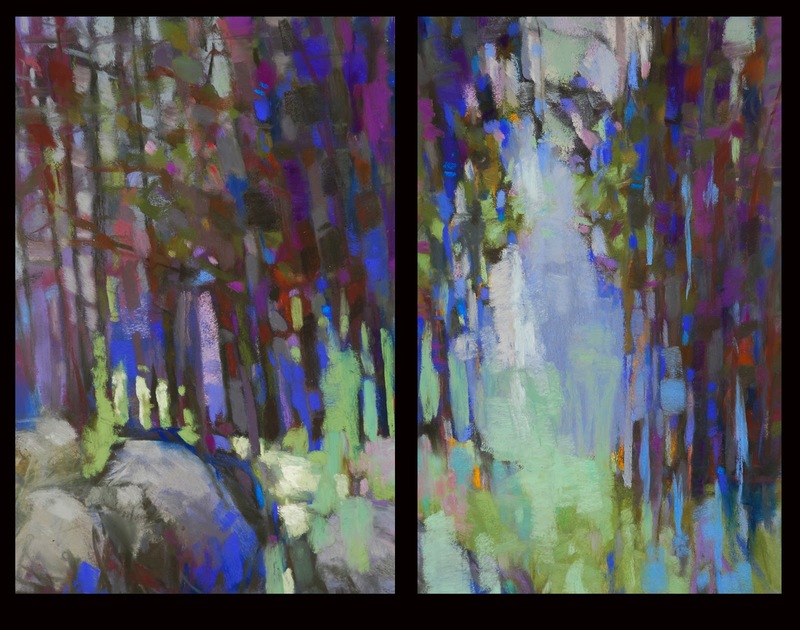 Using pure hues as a supporting underpainting is a strong start, and provides some of the same advantages as neutral undertones, but will also limit your responses. If you wish to begin on white or black ground, then you will have to establish a pattern of hues and values that carry the image and do not contradict one another. 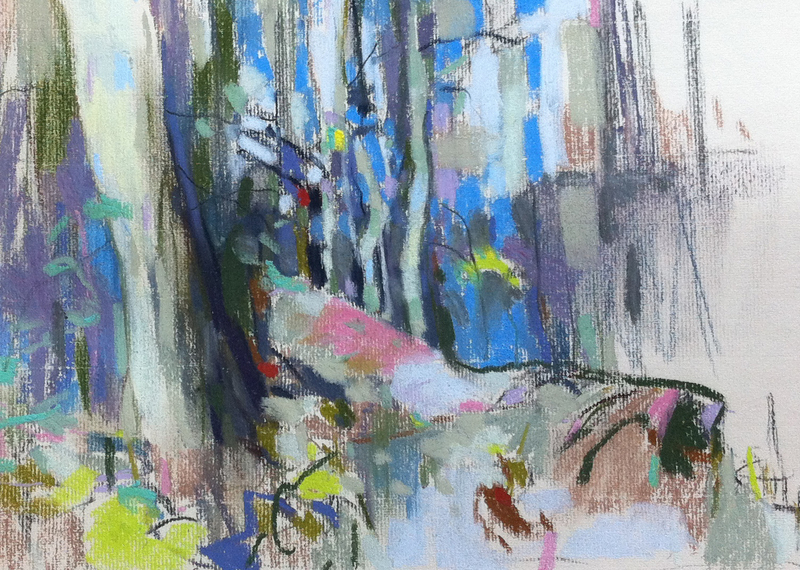 Here is a pastel on white paper which is unified by keeping the main hues analogous, or close to one another on the color wheel: blues, violets and pinks. A few yellows keep it active, and grays used judiciously adopt their neighboring colors and extend the illusion of local sameness. Open marks, paper texture and the white color showing through, and the use of counterchange to harmonize, help to keep this composition together. Here I have used almost the same colors on both brown and white supports. The brown piece is easy to keep unified as respects color, but on the white I have to use the pink-violet throughout the whole image, and it helps that these warm hues are close on the color wheel. The supporting neutral hue, which is a gold ochre, stays in the warm temperature range, and yet creates a conversation with the violets that makes sense: it is pushing the foreground forward, and feels complimentary to the violet, since it has a slight yellow bias. Consider this image which uses pink and green on white laid paper. There is a violet-pink hue under everything. That touch of green at the place where the midground meets the sky, together with the same green in, behind, and under the tree makes the color story of "pink compliments green" work throughout the picture. Imagine this image with the green only in the tree, and nowhere else, and the resulting picture would lack unity. Establish unity by telling a coherent story with all of your lines and also the marks or brush strokes. Repeating shapes and establishing a pattern, as well as textural continuity and rhythm provide threads of unity throughout your picture. Now I have a question for you. Is harmony a requirement of unity in a painting? If so, what about the very successful image, The Scream, by Edvard Munch? I look at The Scream and feel panic, not harmonious and good thoughts! Also, don't you feel a little off balance when you view At the Moulin Rouge, by French artist Henri de Toulouse-Lautrec? These iconic images do evoke the fundamental unity of the ideas held within them, as a result of elemental (formal) unity. They are masterpieces of the power of art to express emotional disquiet and therefore they reveal some of the deeper things of humanity. Unity in the use of the elements of art is one of the tools used in creating these strong works. We accept that disharmony is an aspect of some paintings, just as asymmetry is the opposite of harmony within the element of balance. Unity is something different than harmony; harmony being consonant parts and unity a gathering of the whole. Unity is having great elemental bones in your painting, and portraying your idea with clarity. 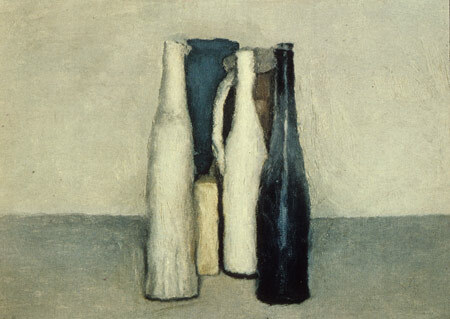 Morandi was a master of the concise still life. Here he shows one near-black or dark cobalt bottle next to an essentially white bottle, setting up a very severe formal insult to an otherwise sedate grouping. But, imagine what it would look like without that indigo box behind and near the left side of the assemblage. The box harmonizes with the black bottle, and establishes a dialogue of the parts. They are saying: l'unità di qualità formali e l'unità delle idee. Wow, thank you so much for this interesting post. I ate it up! About the question towards the end of it: I think that maybe unity can also be in the subject matter. I don't think that unity means merely harmony. It means to me that the artist puts across what he/she wanted to tell us. So there might be disharmonious colours but the unity is kept through for example powerful strokes or direction of them. My question is: Is harmonious colour a prerequisite of a pleasing painting and should a painting always please? That's just it, isn't it? Harmony is different from unity, and many definitions online mush the two together. We are pleased by complimentary colors, which are fundamentally opposed to one another. What we like is the energy and the dialogue. Analogous colors are harmonious, and easy to look at. You're right about the content. And, the 20th C artists showed us how to appreciate lack of harmony in paintings. Excellent Article Casey! Thanks for the visual examples. I hope to share this on my blog today! Thank you, Ruth! I appreciate the share. I have a strong interest in painting in units. 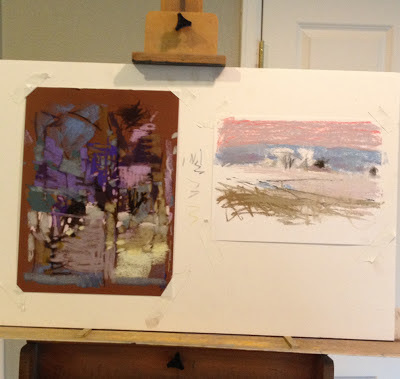 Of the three I've done, two groupings are unified by subject and color continuation; only one is unified by a connective line. None of them are meant to be butted together. The space between is part of the presentation. I intend to continue exploring this. I also intend to come back and read this workshop post slowly--never mind that. I'm going to e-mail it to me. there's a lot to think about here. Thanks Casey. I'm very glad you see the way that unity applies to the corpus as well as a given piece. I have tried to show this in some the other posts on the elements, Linda. Thanks for reading closely. It means much to me. Very nicely and concisely stated, Mr. Klahn. With your permission, I would like to use this post as a reading in the middle school art class that I teach. Please do - it would be my honor to have you share it. Keep in mind it is a series on the elements of art, and I am in the process of researching how to publish this series. But - go ahead and use it.